Well everybun. 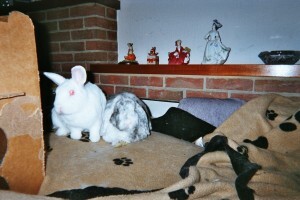 The sun is shining, we have had our treats, and I have Flopsy Girl by my side. Both 2-foots are at home today, so we are getting lots of attention. The only thing that might spoil it all, is that the 2-foots have been talking, and they are BOTH going to go to work tomorrow. Now we will have to wait and see, but I have a nasty suspicion that they will try to get us back in the condo tonight. We have been free-range for over a week now, so I don't fancy that AT ALL!